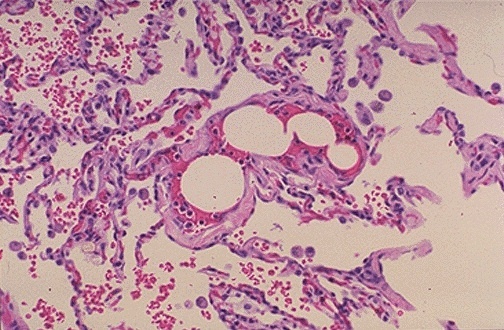 The rounded clear holes seen in the small pulmonary arterial branch in this section of lung are characteristic for fat embolism. Fat embolism syndrome is most often a consequence of trauma with long bone fractures. It can also be seen with extensive soft tissue trauma, burn injuries, severe fatty liver, and very rarely with orthopedic procedures.